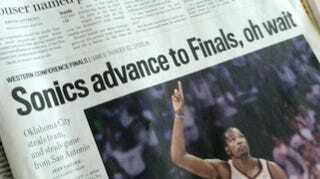 Pacific Northwest Newspaper Headline Sums Up Entire Region's Feelings: "Sonics Advance To Finals, Oh Wait"
At first glance, it looks like some copy editor is trolling Sonics fans on the sports front of the Tri-City Herald in Kennewick, Wash. But then you get to that subhead, and the intention becomes perfectly obvious. It's been four years since the Sonics packed up and left for the Great Plains, and it's still too soon.